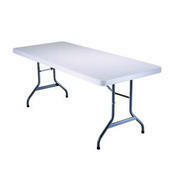 White 6 feet folding tables are perfect for any event. Fits 6 chairs around it perfectly. Contact office if renting multiple items for discounts!